Back in the 60s when I was a child, it was a different world in the bush. Sometimes I think that era had more in common with my parents’ time, than it has with the present day. It was an age of thirty-two-volt lighting plants, kerosene refrigerators, a diet of salt beef, home-grown vegetables, homemade butter and few luxuries. It took an hour and a half to drive forty-four miles to Capella, on a rough dirt road with a dozen gates to open. These trips to Capella or Clermont only happened about once every six weeks. We children did our schooling by correspondence, with our lessons arriving on the mail run. Sometimes in the wet the mailman didn’t get through for weeks, but unfortunately, from our point of view, we seldom ran out of lessons. Usually a pile was sent at the beginning of the year, just in case. We even had library books, which our teachers would choose for us, posted from the Allen Lending Library. They must have done a wonderful job of picking suitable titles, as I remember being fascinated by a selection of authors including Enid Blyton, whose Famous Five series was a favourite. Some of my memories of those days include hot summer nights without a breath of air, sweltering beneath a dusty mosquito net. The first fan we owned ran on thirty-two volts, and was saved for times of dire need. Power was used in a frugal fashion, as the generator was normally only run to charge the batteries, which then powered a few dim lights – and a light was never left on when a person left the room! The exception was on washing day when I’d wake to the throb of the generator, as Mum needed it to run her old wringer washing machine. I used to love lying in bed, listening to the generator – but never for long. Sleeping in was another indulgence we weren’t allowed. We were all as thin as rakes which isn’t surprising when I consider how plain our food was. There was no such thing as takeaway food, except for fish and chips when we were on holiday at the beach. A big treat when we went to town was an icecream, although Mum made our own at home. We always had desserts, mostly milk puddings as Dad milked two or three cows. Bread came from Clermont on the weekly mail run, and if we ran out, Mum made it herself. Of course we loved helping with the mustering and chafed at being kept inside for lessons when Dad was doing something interesting. I remember one morning he planned to ride the bottom boundary fence, a distance of twenty-five to thirty miles. I was determined to go with him even though I was only five or six. Eventually Dad relented but Mum drove down the road to meet us that afternoon and collected me. By that time, I was very happy to see her. We lived for the weekends, when my sister, two brothers and I would saddle our ponies and spend most of the time on horseback, playing cowboys and Indians and other adventurous games. On weekdays, before and after school, we’d play on our push bikes or with stick horses. 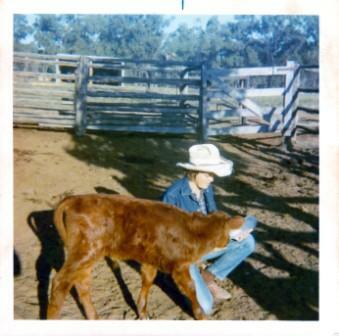 My sister and I used to have our own pretend cattle stations marked out. When we rode our bikes, the sandy tracks made it a challenge and punctures were a frequent hazard. Our games were inspired by our own imaginations and I do feel that is something modern children have lost, in an era when entertainment is laid on. 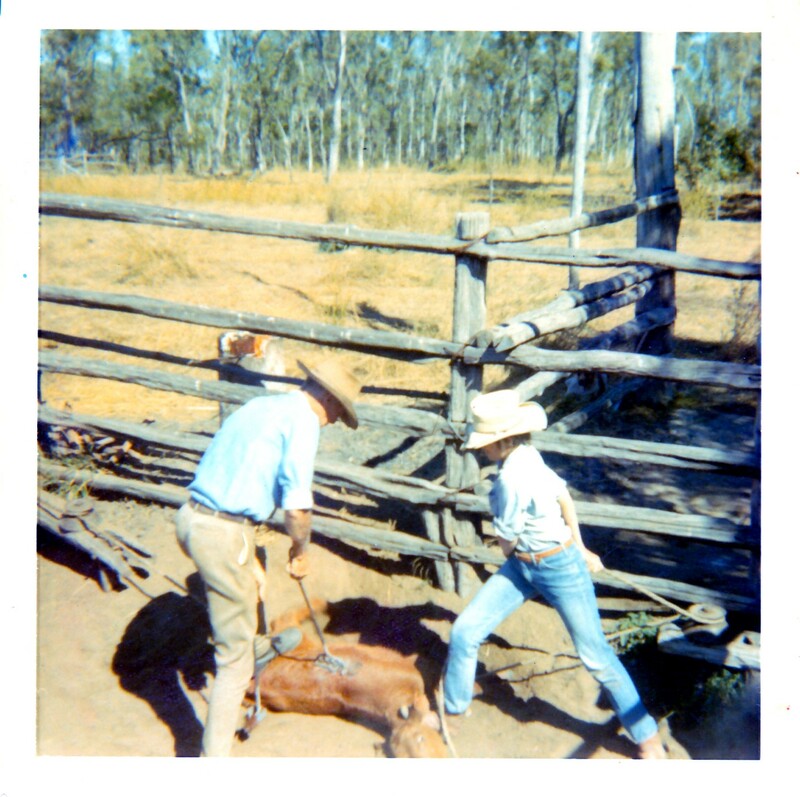 Feeding a poddy calf and branding calves at Booroondarra, circa 1969.